This intensely bold, elegantly-bodied cup provides indisputable proof of the roast masters' consummate artistry. Highest quality Arabica beans are guided to the very edge of noir - just beyond their second crack - then eased back, masterfully, to reveal their rich, full-flavored complexity. It's a delicate balancing act that demands beans of the utmost quality; high altitude Arabica capable of withstanding the intense heat demanded by this darker roast. 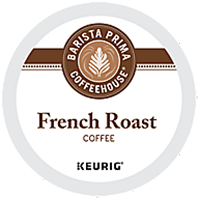 Barista Prima Coffeehouse® roast masters excel at carefully monitoring the tenuous balance between roast and flavor that results in a daringly dark, smoky-sweet brew with a surprisingly light mouthfeel. The ultimate proof? It's in your cup.